Useful cleaning business tips are not all worth their weight in gold. The world has no lack of armchair experts offering advice on pretty much anything. The problem is, these geniuses often have no experience doing what you want to do, yet they'll be glad to tell you just how to go about running your cleaning business. These tips will help you get your cleaning service up and running in no time. Think of this as the champagne of business tips, distilled from more than a decade of experience. Learn from others who have gone before you, and build on their experiences. Then innovate if you wish to create systems that work best for you. Look for someone you can trust, a friendly person whose own business is organized and efficient, and who has experience as a cleaning-service professional. This experience may be in any sort of cleaning service, from housecleaning to commercial cleaning or something else related. The point is that the mentor has faced the same challenges, surprises, and dilemmas as you are about to. A mentor has practical strategies for dealing with these obstacles. They can act as your guide without stepping on your toes. Although only the smartest people take advantage of the embedded wisdom that mentors offer, all independent, self-employed people could use one. This is because the mentor has already traveled through, and mapped, a lot of the same ground you will trek. Why reinvent the wheel? In the cleaning business a good mentor is priceless. You can save truckloads of money and time by seeking the guidance of someone who has walked a mile in your shoes. Action, not words, will catapult your new service into business. Most people who are new to running a cleaning service underestimate the importance of getting out and letting everybody know that they are available. Customers will not come running just because you opened your virtual business doors. But that doesn't mean they don't want your service. Go tell them about it, and get them to give your service a try. It is one thing to have an end-goal in mind, but quite another to have a logical system to follow, ensuring that your goal is reached. We are currently living at a time when it's never been easier to find and connect with people and information. If you need it, chances are you can find it online. And that is where your customers will expect to find you, too. The key here is to use the Internet wisely and liberally and often. But do not depend on it to bring you new business. For that, refer to item number two on our list: Take action, and go get your customers in person. The information you put on your business website, Facebook page and the cleaning tips you tweet to your customers will help your business stabilize and grow. That's for sure. But to launch your business you must be present in person. Show up. Hand out your business flyers to any and all potential customers. This is not brain surgery, but you might be surprised at how incredibly lazy the Internet has rendered some pretty smart people. They figure that if they have a good website and they hang out on Facebook often enough, their business can't help but get popular. Well, nothing could be further from the truth. Your website and your social media messages will absolutely help, but only to the extent that you are also actually taking action – in real life! Your online presence is very important. Customers will research your company at their convenience, and vet you that way. But this is only possible once they have found out about your cleaning company. So get out and take action, let them know about you. There is no substitute for the step-by-step actions you take every day. That is the key to launching and nurturing your growing business. These parts work together, your online persona and your business website work together with your real world actions to create a rock solid business model. 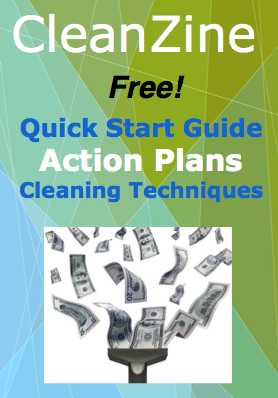 Further reading on cleaning business tips.